On May 27, 2018, the Indian Premier League (IPL) Final will be played at Wankhede Stadium in Mumbai. Millions of fans are expected to be watching via live stream. This will put the content delivery networks and communications infrastructure which enables this technology on overtime. The IPL fans’ demands for high quality, low-latency and accessibility require a robust communications infrastructure that works quietly behind the scenes. Live events are major growth areas for streaming services, as are the events themselves. Yet consumers demand more than a grainy image moving across their screens. High definition streaming at 4k and in the future 8k, 360-degree viewing and 3D formats, and augmented and virtual reality media are either coming or are now here. These create serious challenges for data transmission. That challenge is multiplied when millions of users at the same time are accessing the same live content. Live streaming has 3 times more viewership than its non-live counterparts (source: Facebook, 2016). This is a logical finding given that “live”, especially in sports, is the only acceptable kind of viewership for most users. Considering the challenges that live event streaming creates for data transmission, a simple metaphor to use is that of a busy highway system: the congested artery is usually found at rush hour in high density metro areas, specifically at the beginning and end of the day and during weekdays. In the same way, internet traffic during the IPL Final on May 27th will have the same fundamental issue of that “rush hour” jam. If the jam stops or slows down traffic too much, users will drop and the revenue along with it. Of course, this won’t be positive for the streaming service or any of the downstream technologies which enable it. The supply chain and technology needed to deliver a high-quality IPL Final live stream is immense and complex: switching, routing, amplifying, converting, transmitting, receiving, and storing in fractions of a second, simultaneously, cost-effectively, and safely, through hundreds of millions of devices. We will now purposely turn this conversation to a specific area of the potential traffic jam itself—the transceivers, switches, fiber in and out of the data center, and wireless amplification technology needed to deliver high quality live events directly to the user. ROADM (reconfigurable optical add-drop multiplexer) technology was developed to more efficiently route traffic and avoid these traffic jams; it serves as the highway switching system to reroute traffic in peak periods without having to spend vast amounts of money to make “new highways”. Given the increasing demands of video image quality, nearly every connection in and out of the data center today is optoelectronic (a combination of electricity and light to move, decode, recode and transmit information); this is in place of the previous copper transmit technology which cannot handle current bandwidth requirements. Optically is the only way to transmit the amount of information required, at speed, and to millions of users at the same time. Companies who make the optoelectronic devices have found ways to increase the amount of information that travels through the light by deploying “modulation” and then increasing the amount modulation (known as QAM or quadrature amplitude modulation). In addition to QAM, baud rate (or symbol rate) serves to couple bits into symbols so that more information can be sent in each modulation phase. ROADM, QAM and opto-electronic transceiver technology are essential to the IPL fan’s ability to receive a high quality live stream on his handset. The below table shows how QAM modulation progresses, increasing the amount of information that can be transmitted. How are our IPL fans streaming this championship on their wireless handsets? The IPL fan on his handset is getting the match from a wireless signal. That signal is coming from closest RF wireless base station (not the data center or its servers). 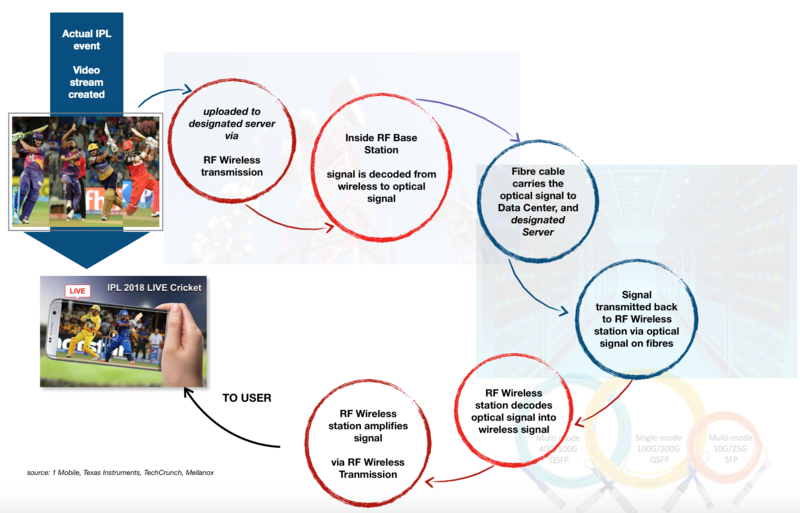 This means that the RF wireless amplification technology must be keeping up with the innovations in servers, CDNs, fiber optics, active optical cables and optical transmission devices technologies. And they in turn must be keeping up with the media and information demands of its paying customers. There are many other supporting technologies not covered which are required to make this IPL match live stream possible. Consumer demands for high-quality live content create a tremendous challenge and opportunity not only for the streaming service itself, but also for Content Delivery Networks (CDNs), Network Equipment Manufacturers (NEMs), Optical device manufacturers and RF wireless amplifier device manufacturers. Behind all of these is a vast array of design, fabrication, testing, assembly, and packaging technologies who also stand to be challenged and rewarded if successful. IPL Cricket Live Stream in 2018 has received a lot of publicity due to its record setting numbers (7 million people watching). If you take an event like the Olympics that has a wider global audience, the capacity required would likely be greater. Other events like the Super Bowl, World Cup, or Final Four could draw similar numbers. The optoelectronic, photonic and RF wireless devices must be able to handle this need for bandwidth and capacity at scale. The current transceiver standard within the data center is 100G and several companies this year have launched 400G solutions. Yet cost per devices and cost per G still remain a pressing issue—both material and assembly costs. It is therefore bandwidth, performance, and cost that are the forces driving silicon photonics, advances in optical sub-systems, QAM, and baud rate. At the R&D device level, there is work being done with plasmonics and quantum wells and dots as potential additives or replacements for other costly components. Looking to RF Wireless amplifiers, there is little doubt that RF GaN will be the long-term replacement for LDMOS technology. RF GaN is critical for simultaneous live streaming capacity because it can operate at high frequencies, has better input power robustness, and more favorable thermal properties. For many years the factor holding back GaN has been cost; however, today we see several device manufacturers in this area finding ways to bring RF GaN device and packaging costs down to be at parity with LDMOS. Palomar has developed several cost-effective assembly technologies for die attach, wire bond, and void-free vacuum reflow for both opto and RF device packaging. New materials and new compound semiconductor materials require different tooling, wider force ranges, and innovative heating/cooling methods. Ultimately, it is the pursuit of lowering cost per device (material, assembly, test) while improving performance that matters in the end.